The Booklet of Industrial Metrics to the Development of the Oil and Gas Sector is a publication of FGV Energia in partnership with FGV Projetos that brings the analysis of the performance of public sector policies, seeking to play a structural and methodologically based light on the in order to provide, in an exempt and transparent manner, information that allows the development of a clear vision, collaborating with the identification of actions that maximize the national oil potential. The publication is the result of research conducted in a joint effort of different units of the Fundação Getúlio Vargas. 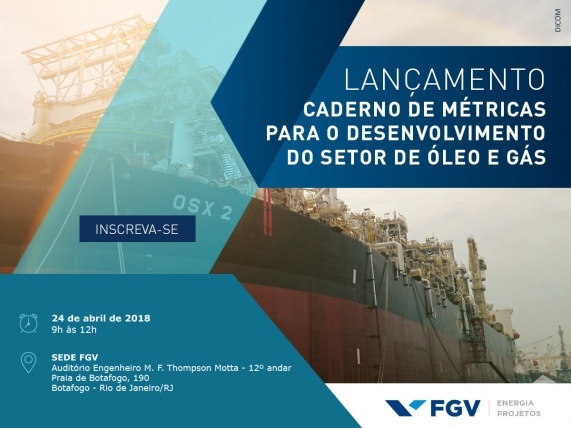 The production also highlights points such as fundamentals of industrial policy, case studies, industry metrics and Industrial Policy in the Oil & Gas Sector Brazil, as well as issues of economic and market regulatory issues and the results achieved in the surveys allow analysis performance of public policies. The authors of the edition are Baiena Feijolo, Eduardo Santiago Rossetti, Felipe Gonçalves, Fernanda Delgado, João Augusto Pereira Batista, Júlia Febraro França Gomes da Silva, Magda Maria de Regina Chambriard, Maria Alice de Gusmão Veloso, Mauricio Canêdo Pinheiro and Pedro Henrique Gonçalves Neves. FGV Energia understands that the dissemination of knowledge and long-term planning are imperative for technical and scientific progress, gains in competitiveness and, thefore, economic development and social welfare. The proposal presented in this paper goes beyond the creation of reference values for expedited analyzes, the main objective is the definition of the parameters and premises for the creation of a decision-making model fot the development of public policies. Venue: Centro Cultural FGV. Praia de Botafogo, 186, Botafogo, Rio de Janeiro/RJ, next to the heardquarters of the Fundação Getúlio Vargas.